The Virginia Armory was established by a vote of the Virginia General Assembly in January of 1798, for several reasons, but it boiled down to the protection of the sovereignty of the State rather than the Federal Government. While the Armory was to produce varied arms, its main goal was to produce muskets for Virginia. The first muskets were produced in 1802. In all 336 muskets were completed in 1802. Musket design remained basically the same until 1809. Transitional changes were made in1810 and a Second Model in 1812. The 1812 model continued with minor changes until 1821 at which time production ceased after having produced 58,428 firearms of all types. These arms were brought into service upon Virginia’s secession and many a Virginian marched into battle at Manassas with these flintlocks. The musket shown here is dated 1818, and I dare say this musket’s original condition is among the finest of these arms left in existence. The 42 inch, .69 caliber musket is completely original in all regards. All assembly numbers match and all secondary ciphers match; every single piece of this musket is original, even the flint may be original. The musket appears to have been fired very little, but the flint has been dropped a few times, based on the scratches on the frizzen. 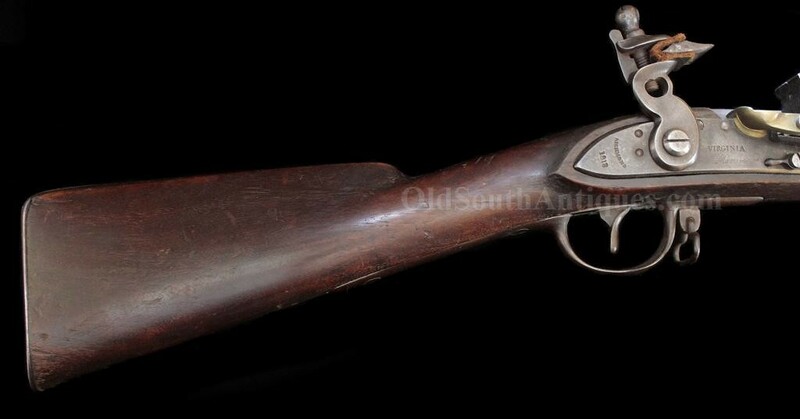 The walnut stock is in great shape; the lines are sharp, crisp and perfect, the bore is good; the markings are crisp and perfect; the lock works perfectly. I think this an extraordinary bargain.